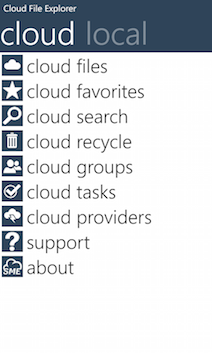 The SME Windows Phone Client is available for use on Cloud or on-premises. 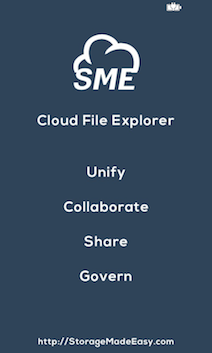 Google Docs, Google Drive, Google Storage, Google Sites, iCloud,Amazon S3, Microsoft OneDrive, DropBox, Azure Blob Storage, Box, RackSpace Cloud Files, OpenStack Swift, Mirantis, Gmail, Email (IMAP), SwiftStack, HP Object Cloud Storage, S3 compliant Clouds such as (Eucalyptus Walrus), SoftLayer, iKeepinCloud, PogoPlug, BaseCamp, IBM Connections Files,EMC Atmos, Office365, SharePoint, CloudMe, HostingSolutions.it, Scality, Alfresco (on-premise), Zimbra Briefcase, SafeSync(WebDav enabled), FilesAnywhere (WebDav enabled), Cloudian, CleverSafe, ActiveScale, Jive, Salesforce, Egnyte, CMIS, Memset, and any WebDav or FTP enabled Cloud. 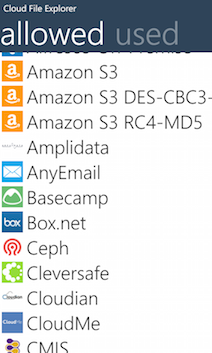 Synchronise data from your Cloud directly to your Windows Phone device. 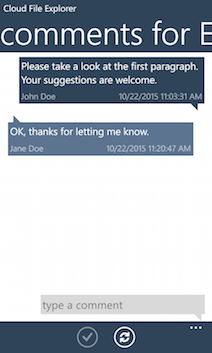 Also synchronise photos, voice memos and notes. 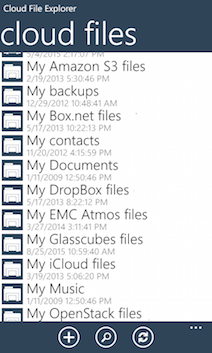 Instant access to files anytime, anywhere direct from a Windows Phone device. All file events audited (business or enterprise account required).